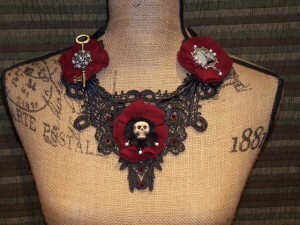 I am in love with this dramatic, conversation starting piece! A lace applique was used as the base for the design as with the ones from my bottle cap collection but, the lace applique in this piece is black and much larger. 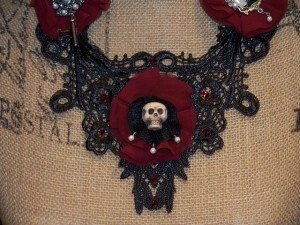 The black and burgundy colour palette evokes a dark and romantic feel to this creation. 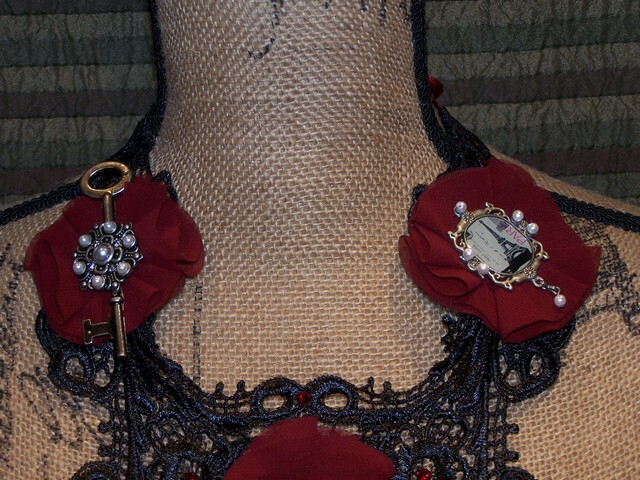 In continuation of that theme, wine toned chiffon florets, a skull center focal point and pewter toned key, pearl medallion and Paris frame charm embellishments were included as décor elements. White pearls and deep wine red Swarovski crystals add further elegance and sparkle to this showstopper. While this is a more substantial piece to wear, it is fairly lightweight, lies very flat and ties around the wearer’s neck with a wire edged, burgundy ribbon. This is one piece that while I hope someone falls in love with and claims for their own, I am more than okay with it not selling and having to become part of my own personal collection! Sigh, such is the peril and pitfall of being a wearable art artist…you fall in love with each piece and as such, are pleased as punch when one sells but also have bear that melancholy feeling when it leaves your world for someone else’s.